It was cut, deep. One look and I knew it needed to be stitched. Nesa said I don’t need to go to the hospital… I honestly wanted to believe him, but I lost faith when it didn’t stop bleeding for the 15 minutes we applied pressure and ice. I was not scared nor was I breaking down. It was badly cut, doing that wudnt help at all. I needed to stop bleeding. I was determined and focused. I needed to get it stitched. Just at the right that time, LiShan came in and offered to take me to a 24hr clinic nearby. I agreed. Jason used his handkerchief as a tourniquet and 5 people set out on a quest to get me stitched. Jason, Lishan, Nesa, Rose & I. It was a 25 minute walk from St George to the clinic. And we had fun on d way. We chat, we sang & I found some true friends. It is usually said, a friend in need is a friend indeed. Well I found that true, I was in need. However, I also did find that a friend who meets a need, is the true friend indeed. But the cool night and enjoyable flight was ended with disappointment. The clinic was not 24hrs, it shut at 11pm. A white Skyline drove by and Jason popped his head out of the car. It was my ride to stitch heaven. The car was too small for 6ppl, so someone had to leave the quest. Nesa & Jason left. It was Lishan, Rose and I in the car with Zhang Ter driving to the hospital. 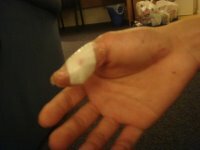 Upon arrival, I showed the nurse at registration my cut and had my tourniquet removed. She gave me a comfortable dressing to wrap around my thumb. I was told to grab my thumb with my palm and apply gentle pressure. And just as in any kind of hospital, a registration form had to be filled. Rose was my secretary and I was the VIP, she did wadeva I told her to. She was the hand that I did not have, she filled in the form for me. She was so many things, but mostly, a source of comfort during a season of pain. Thank you so much, Rose. 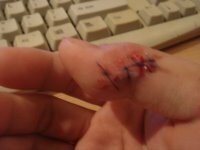 After another wait, a doctor finally came to stitch my wound. I got 4 stitches and a tetanus jab. I will spare you the gross explanation. Every time I do it, girls squeal and squirm as if it’s happening to them… so I’m leaving the juicy bits out. However, if you are curious about the gore of the whole event, do contact me for a full graphic story! - & Especially to Wen Jie! Note to self: next time open a jammed window by hitting on the frame instead.